Paracord Eyeglasses Retainer - "Fovea"
This neon orange Handmade 550 lb Paracord Eyeglass and Sunglass Neck Strap Retainer is a great way to keep your eyewear connected to you in all types of situations, whether in use or not! 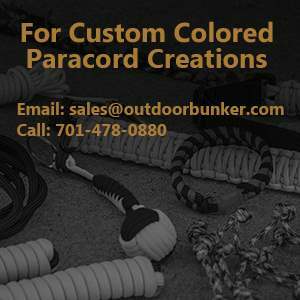 The Paracord used is a tough, durable and reliable cord that does not rot or fade to UV sunlight. It is also mildew resistant, dries quickly and resists abrasion. The soft rubber ends will grab on without budging, but when need be, they can be easily removed. The total length of retainer is approximately 24 inches and they are available in many colors, so you can choose the right one for you! Paracord Eyeglasses Retainer - "Lens"
Paracord Eyeglasses Retainer - "Focus"
Paracord Eyeglasses Retainer - "Macula"
Paracord Eyeglasses Retainer - "Optic"
Paracord Eyeglasses Retainer - "Cornea"
Paracord Eyeglasses Retainer - "Eye"
Paracord Eyeglasses Retainer - "Pupil"
Paracord Eyeglasses Retainer - "Spectacles"
Paracord Eyeglasses Retainer - "Retina"
Paracord Eyeglasses Retainer - "Scera"